Those of you acquainted with the inimitable Ander Webbs have been waiting for this one for a while. Once dubbed ADW Freak, the souped-up version of everyone's favourite open-source launcher has arrived, and it's now named ADW Ex. On the surface, Ex brings ... well, it brings crazy transitions and UI effects, mainly. But underneath all that is some pretty impressive performance improvements. In a launcher, the real place where performance counts is in the drawer scrolling, and if you've been feeling that ADW is a bit laggy lately, Ex will quell your frustration with its silky smoothness. Combine that with some cheekily named "4D" effects, a handful of desktop scrolling transitions, and the ability to tinker with your desktop icons and you have a pretty compelling revamp of this third-party desktop stalwart. 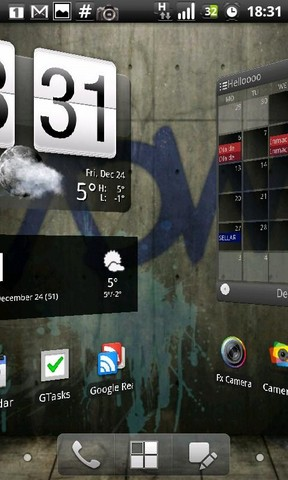 Different desktop transitions: new animations while navigating through your desktop screens. Try them all, they're crazy!!! New Icons configurations/look and feel: Tweak your desktop icons, change its sizes, add coloured backgrounds, change font size, color, etc! New fast presets mode: Quickly change the whole desktop configuration by 1 click! Editable desktop icons for applications, shortcuts and folders! More, more more to come!! 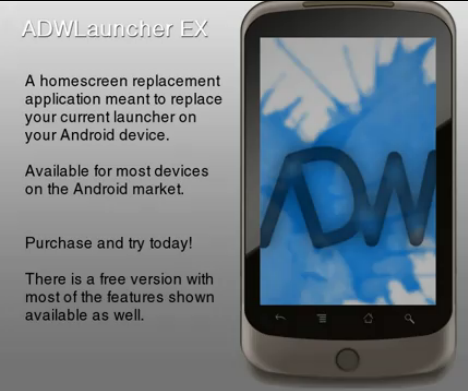 However, unlike the standard ADW Launcher, ADW Launcher Ex comes at a price. Still, at €2.50 (~$3.50), it's difficult to complain. ADW Launcher has been free and open-sourced for so long now that it's only fair to give something back (for Christmas!). 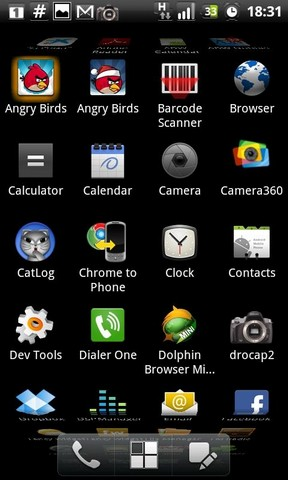 On the other hand, one can but hope that some of these new features will trickle down into the ADW packed in with CyanogenMod 7. Check it in the Market if you feel like getting your Freak Ex on.